I started off intending to write an article breaking down “The 5 Best Landing Pages for Photographers.” But after about a couple hours of digging around online, I came to a realization: most Photographers don't use landing pages. I was amazed to see how many photographers were driving paid traffic to websites with no form, no value proposition, and no call to action. If you're a photographer and your goal is to generate sales online, then grab a pen, because we're about to turn your webpage into a lead generation machine. In this article I'll be explaining some landing page basics; what makes a bad landing page, what makes a good landing page, and what strategies you can implement to increase your conversion rate today. A landing page is basically just a page of your website built for one specific purpose. All elements of a landing page should work together to push visitors towards the completion of a conversion goal. What is a Conversion Goal? A conversion goal can be to subscribe to a newsletter, complete a contact form, click through to another page, or to make a purchase. Tip: A good conversion goal for photographers is getting users to complete a contact form. 1. There is no call to action. Users have already expressed interest in your service when they clicked on your ad or link. Don't waste that interest by making it harder to engage with you. Don’t just hope they’ll eventually find your contact form hidden on a random page within your site. When people come to your landing page, it should be clear what you offer and what action they’re supposed to take next. 2. There is no correlation between the ad and the landing page text. The ad text describes the site as "Whistler Vancouver Wedding Photography", but there is no mention of that once a user arrives on the page. Make sure your message is consistent across both your ad and your landing page. Saying one thing in your ads and another on your landing page is a sure way to get people confused once they reach your site. 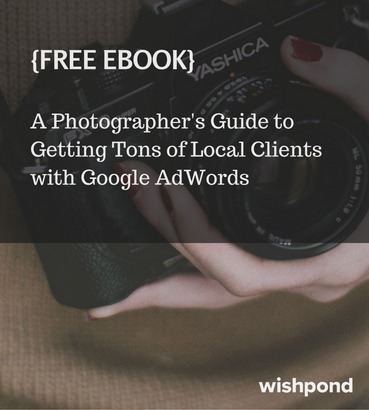 For more on how to optimize your Google Adwords campaign (written specifically for photographers) check out A Photographer's Guide to Getting Tons of Local Clients with Google AdWords. 3. There is no value proposition. While photos are nice (and necessary to showcase your expertise in the field), don't forget to explain what you offer and how you’re different from your competitors. Studies show that users leave websites after 10 seconds if they feel that their needs are not being met. Make sure that your landing page clearly explains who you are and what you can do, alongside featuring your work. Actionable Tip #2: Simplify your value proposition into a bulleted list to make it easy for people to quickly scan what you offer and how you can benefit them. 4. There is no contact form. How are your site visitors supposed to get in touch with you? By increasing the number of steps that it takes to contact you (like hiding your contact details somewhere in an “About Me” page, you decrease the number of sales you’ll generate from your site. Actionable Tip #3: When creating a form, it's been proven that reducing the number of form fields increases conversion rates. Now that we've broken down what's wrong with a typical photography landing page, let's take a look at a better example to get you going in the right direction. 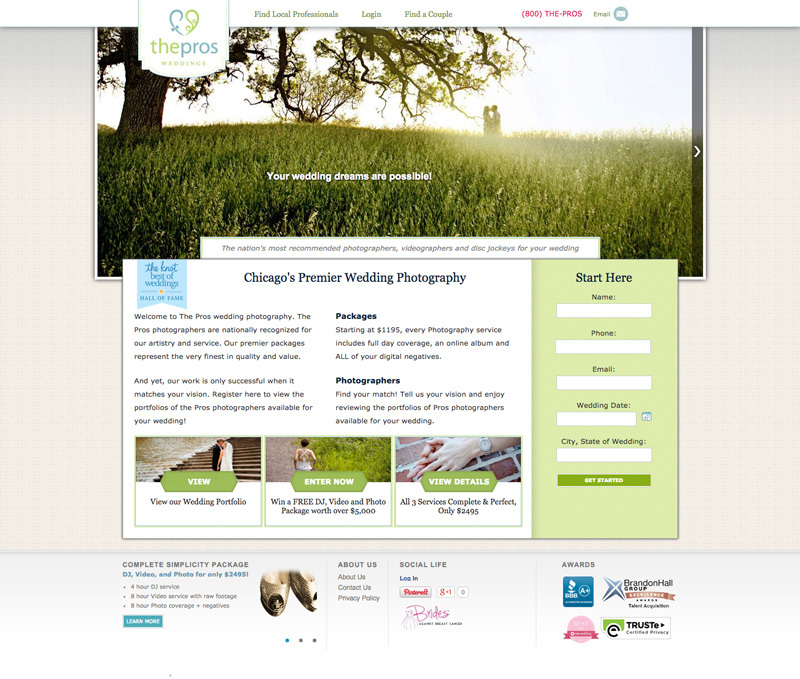 The Pros is a wedding photography and DJ service. While they offer a number of services, when you arrive on this specific landing page, it's very clear who they are, what they offer, and how to get started. While aesthetically some people may prefer the look of the other landing page (and I’m one of those people), the example above has a lot of key elements that are missing from the other page - such as a CTA, value proposition, unique selling point, and contact form. It can be difficult as a photographer to sacrifice what you see as a beautiful webpage in order to drive more leads and sales, but take my word for it: your wallet will thank you. Take some tips from this example and you'll be ahead of the curve, especially when your main objective is to generate more customers online. 1. The page reinforces the ad offering. My search on Google for 'Chicago Photographer' yielded a result with the headline "Wedding Photography $1195". If I were to click on this ad, clearly something about wedding photography and that specific price were interesting to me. When I click through to the site, this price is again reinforced on the page along with more details about what is included for that price. Now I know I'll get a full day of coverage, an online photo album, and all of my digital negatives. 2. There's a Call to Action. The words "Get Started" on the right side of the screen provide a great opportunity for users who are ready to contact The Pros. Since a CTA is the last actionable step users will take in order to get in touch with you, spend the time to make sure it's easy to see and is phrased in a way that motivates users to action so you don't end up wasting advertising dollars on a page that doesn't convert. On the bottom right hand corner of the screen there's a number of awards displayed to showcase their credibility and expertise in the field. Your site visitors are naturally attracted to people, places, and businesses that have already been verified by others. By adding a number of awards within eyesight of their CTA, The Pros are able to increase their credibility in the eyes of first times visitors. 4. There is a Unique Selling proposition. "The nation's most recommended photographers, videographers, and disc jockeys for your wedding." There is something to be said about being the most recommended company in your industry. Find what's unique about your business and communicate that through your landing page. We've just broken down some of the key components that separate a good photography landing page from a bad one. Ensure your landing page has at least a couple of the key elements listed here and you’ll be off to a good start. Creating a high quality landing page doesn't mean you have sacrifice visual design for a sales pitch. Just be conscious of what your users are looking for, what offer you’re presenting them, and how easy it is for them to get in touch with you.